The best part about these custom business cards were that they were incredibly easy to make. All I had to do was pick my designs (don't worry, if you aren't super creative they also have pre-set ones set up for you!) add the colors of my choice and add my information. As I said I've been attempting to make these cards for about a year, but no one could offer me all the unique options I was looking for. Either they didn't have the right colors, fonts, and styles, or they wouldn't let me add all the info I wanted. Luckily Basic Invite has a wide variety of unique business card options including so many ways to customize them perfectly to you. 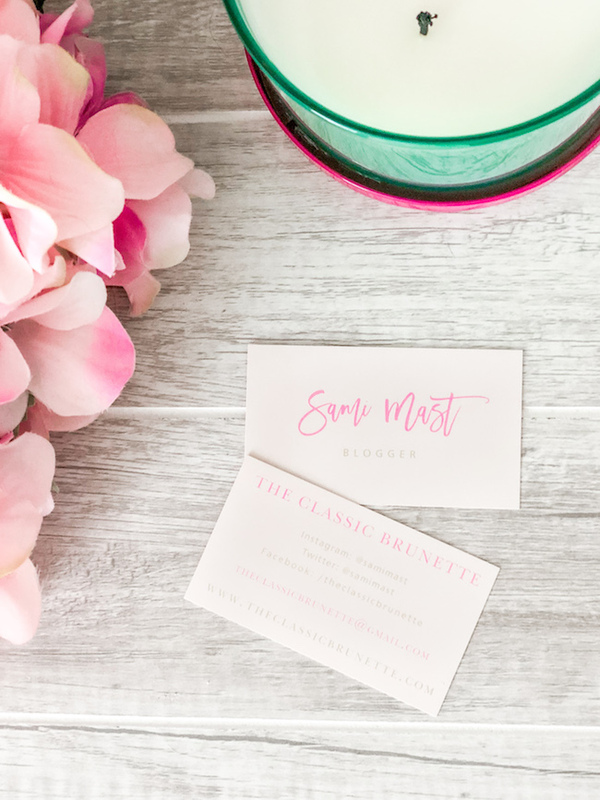 Now I've heard on both ends of the spectrum why bloggers either absolutely need or don't need to have business cards, but I'm here to tell you that they are totally necessary! Just like any other career you network, attend meetings, conferences, and talk with others about your job. If you're like me you probably even end up chatting with strangers about blogging and all the work you do (I promise they ask about it first, haha!). Either way it's always good to have a business card handy, since you never know who you may run into and how they can affect your career. Whether they're someone you can network with, a new reader, or someone who just wants to pass your information on to a friend or family member, they are the perfect way to get your name out there! 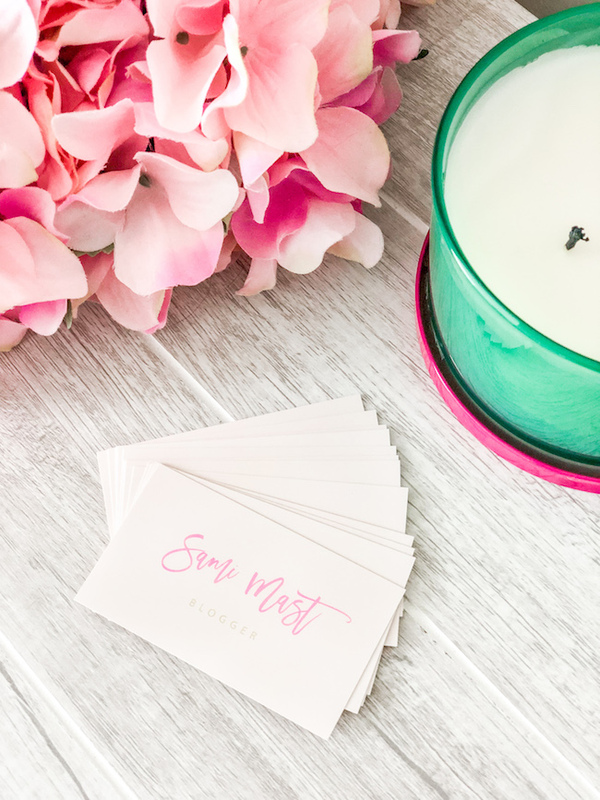 Now that we've established why business cards are something every blogger should have, let's talk a little more about what you should have on your cards. Seems kind of like a "duh!" thing, but you would be surprised how many people only think to put their blog name or just their first name. 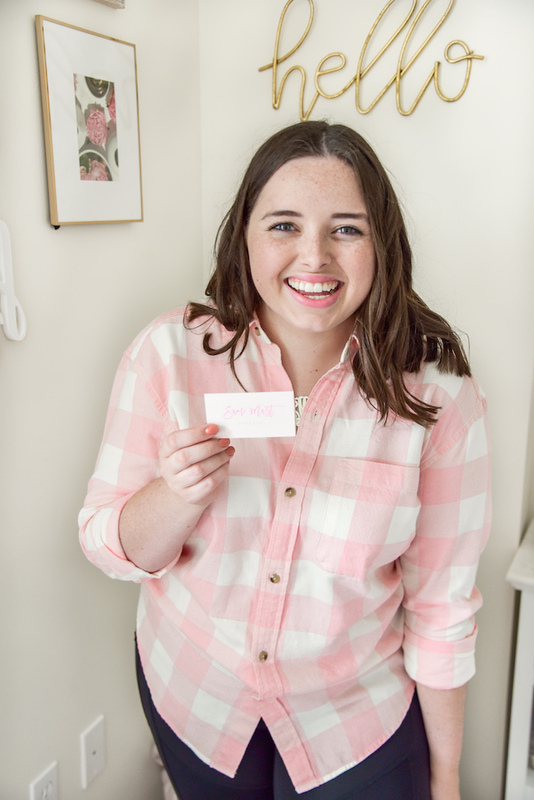 Of course some people might prefer to be more anonymous on their blog by not sharing their last name or even their name at all, however if you're handing out business cards it's likely you'll be trying to connect on a more personal level. By adding your name you're taking that first step by building that connection. Some people think it's a little redundant to add both, especially if the URL is the same as the name, however you want to idiot-proof your business cards! You want to make sure you are leading people directly to your website and having it in print multiple ways is sure to do that. I suggest adding your most used channels, no need to add the ones that you never update! I chose to add my Instagram, Twitter, and Facebook Page as those are the most important ones for me and my blog. 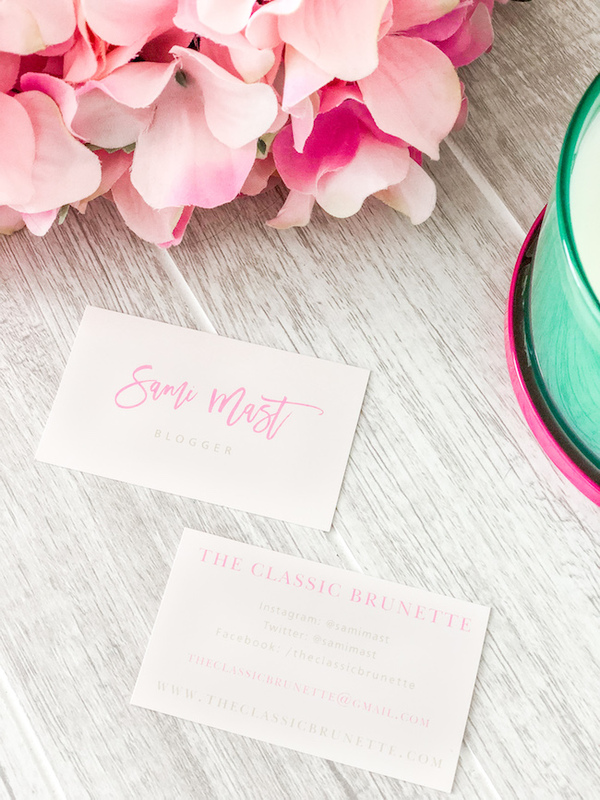 A blogger's social channels are incredibly important as they can help you both maintain and grow your audience, so including them on your business cards is the perfect way to advertise and add to your followers! If you don't have a blog email set up already, start there! It's so important to have a professional email where brands and readers can reach you. A simple gmail will work, however if you want to get fancy you can purchase an email that is @yourblogname.com. Some bloggers also choose to include a phone number, although I don't find that necessary. I already get too many unknown and spam callers, I don't need to have my cell phone number out there for everyone! Business cards definitely don't have to be as difficult to create as some people make them out to be! With Basic Invite's easy custom card designs you can make your own unique designs in a pinch and have them be perfectly aligned with your brand! If you're not in the market for business cards, Basic Invite has a ton of other paper products to offer from custom stationary to beautiful holiday cards. 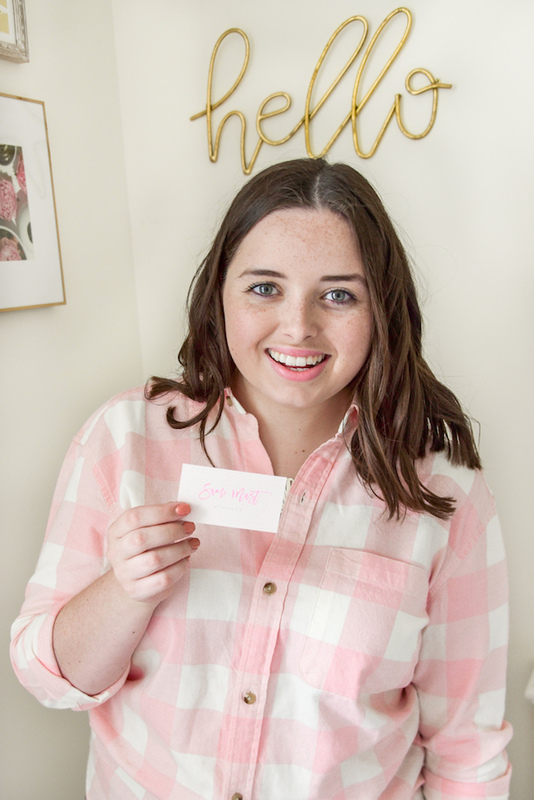 What are your opinions on blogger business cards? Do you think they're necessary? Would you add any other information to them? Oooo I’ve never thought about making business cards but duh! This is important! Thanks for the tips! I actually have one too! I give it to sponsors or prospective clients. It makes your blog or website more professional. I never thought about it but it's actually a really good point! I'm so glad I found this post! I've been wanting to get my own cards for months, but I didn't think it was very common for bloggers and I felt kind of silly, but seeing how gorgeous yours came out has made me want to get them made finally! I've been wondering about this, because sometimes strangers compliment my outfits. Then I asked my boyfriend if he thought it was weird to have business cards, and of course he said it was a great idea! Thanks for sharing. I'll have to get some! Your business cards are so cute, Sami!!!! I love the styling. 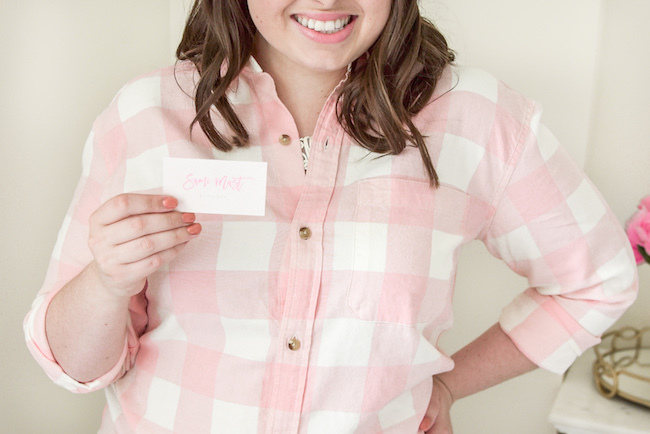 You're so right about how it's important for bloggers to have business cards. When I was first starting out, I attended a conference where I was asked for a card and I didn't have one. I went home and ordered some the very next day! Business cards are a great way to grow your network and connect with others in the industry. Thanks for sharing + glad you're feeling better! Yes! I got business cards for my blog a while back when I was invited to NYFW because I knew a lot of networking would be involved. I think I'm due for a new set though so thanks for the reminder! I’ve been on the fence about getting cards, but these are absolutely gorgeous. And your post made some good points about why I should definitely get business cards. Your Business Cards are so cute! I use mine all the time at events I totally agree! Yes! Business cards are so great for networking so that people can remember you especially from events.